The BenQ MP77ST is a short throw, XGA resolution projector with high brightness and a full feature set that includes 3D capability. It is one of BenQ's "Professional" projector models. While this projector is intended for use in conference rooms or classrooms, it includes features normally found in home projectors - such as an HDMI input, a 3D Color Management System, and a Cinema mode that is relatively accurate to video standards in out of the box settings. The unique lens assembly gives the MP776ST the ability to produce an image that is 1.67 times wide as the distance of the projector from the screen. This short throw distance makes the projector a great fit for small conference rooms that require a large projected image or for the interactive classroom. The BenQ MP776ST features a maintenance free design, network control capability and additional presentation-specific features that make it a great 'future-proof' fit for the office or classroom that needs a large format, high quality and bright image. Brightness & Picture Quality: The MP776ST measured 2,715 ANSI-lumens in the brightest possible mode - normal lamp, 'Presentation' mode and Brilliant Color on. 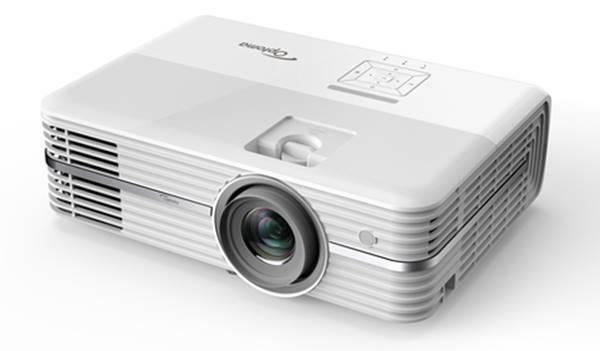 While not quite meeting the published specification of 3,500 ANSI lumens, the BenQ MP776ST is a very bright projector, capable of filling large screens in environments that include ambient light. Switching to 'economic' lamp mode reduced brightness by only 12% and provides an additional 33% of lamp run time per BenQ's specifications - lamps are rated at 3,000 hours in normal or 4,000 hours in economic mode. The Brilliant Color feature is described by BenQ as a "color-processing algorithm" that enables a brighter image by selectively increasing brightness in the "mid-tones" of an image. Brilliant Color mode has a large contribution to the MP776ST's high brightness. Using the same max brightness image mode but with Brilliant Color off, the MP776ST drops to a measured brightness of 1,752 ANSI lumens. For presentation-based material, the use of Brilliant Color had no noticeable side effects and would be highly recommended for the increase in brightness. Another factor that contributes to the MP776ST's ability to produces images of high impact is the respectable 2,400:1 on-off contrast ratio (as specified by BenQ). The combination of this level of on-off contrast and the MP776ST's high brightness help the projector to display clearly delineated text and reproduce static images with a noticeable amount of image "pop". Video performance of the MP776ST is above average - video settings based on the Cinema image pre-set and using the T3 color temperature show accurate flesh tones and primary colors that are solid, but not garish. The MP776ST also includes the capability to fine tune hue, saturation and gain of each of the 6 primary and secondary colors using the 3D Color Management System - a useful feature if the projector will be calibrated for video playback. The overall image accuracy in the Cinema setting does come at the expense of brightness - the image with the optimal video setting measured 1,066 ANSI-lumens with Brilliant Color on. While this is significantly less than the max brightness in presentation mode, this amount of light is about double that of the typical home theater projector, so it is more than sufficient for normal screen sizes in dark, light controlled environments. Is it available here in Philippines?